True to its long history, Pico Mountain continues to foster lessons for children that the National Winter Sports Education Foundation (NWSEF) has awarded a $25,000 grant to expand the Pico School Program. The program offers a weekly ski/snowboard lesson to students in grades one through 12 on Mondays, Thursdays, and Fridays. NWSEF has a mission to improve the lives, health, and fitness of youth through winter sports. Pico welcomes students to encourage winter sports wellness. Since 2012, NWSEF has provided financial resources and program support to Youth Learn to Ski and Snowboard programs across the country. This year, approximately 25,000 youth will learn to ski or snowboard through their grantee programs. 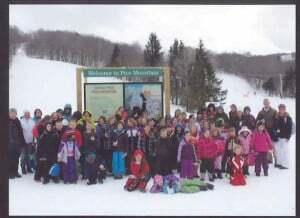 “This is an opportunity many students may not get otherwise, and through this program we are developing a passion for winter sports and love of the outdoors,” said Katherine MacLauchlan, manager of Pico Snowsports, Competitions and Child Care. She also noted that local school children often stay with the program throughout their school years, thus improving their skills. The 90-minute lessons with Pico instructors includes rental equipment and lift tickets. During the 2016-17 season over 400 students from 12 schools participated in the program. Students leaving the program, either due to aging out or changing schools, receive a learner’s permit which includes 50 percent off lift tickets, rentals and lessons for the current and next season. The program begins Jan. 18, 2018. Schools can sign up by contacting MacLauchlan (katherine@picomountain.com). Pico also makes skiing very affordable with a Vermont Student Pass available to all Vermont youth in grades K-12. The cost is $89 through Dec. 17, 2017 and $109 after. The pass grants unlimited access to Pico (valid every day Pico is open) and comes with rental and parent discounts.